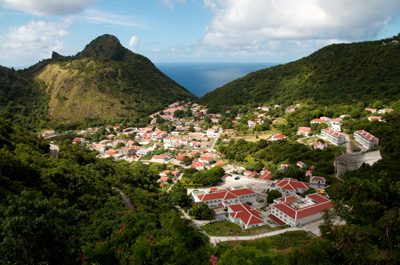 Saba is an emerald island in an aquamarine sea. 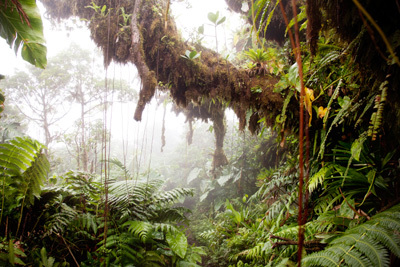 The densely wooded flanks of an extinct volcano boldy rise nearly 3,000 ft above the Caribbean Sea. Although only a quick 15 minute flight from St. Maarten, the island is far from the cares of the modern world. You will not find mass tourism, all-inclusive resorts or miles of pearly white beaches, but you will find overwhelmingly beautiful nature, a fabulous underwater world and a local population who add a whole new dimension to the concept of hospitality. 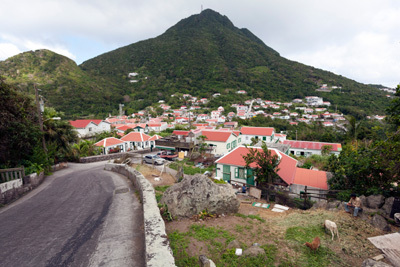 Soon after arriving, you’ll realize why the people of Saba refer to their island as ‘The Unspoiled Queen’. 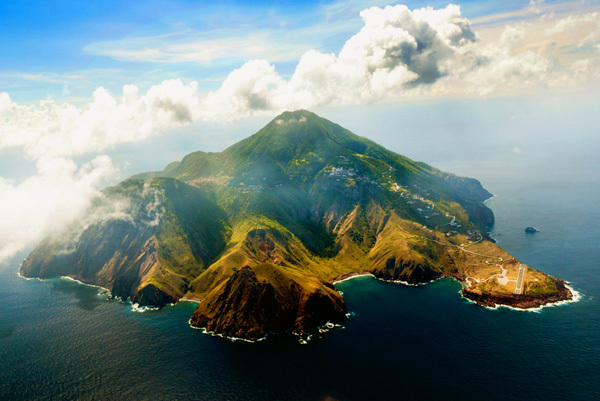 Saba is a volcanic island that rises steeply from the ocean. Lava tunnels and hot springs remind divers of the island’s dramatic origins. The extremely varied diving includes bizarre looking pinnacles rising straight up from unfathomable depths. A busy population of colorful tropical fish as well as large groupers and jacks inhabit the waters around Saba. Along the edge of Saba’s sheer wall dives, divers can sight turtles and rays of all shapes and sizes. The small leeward side hosts gentle, medium-depth, spur-and-groove formations. 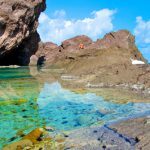 Down to a depth of 200 feet, the entire coastline around Saba falls under the protection of the Saba Marine Park, founded in 1987 and managed by the Saba Conservation Foundation. All dive operations abide by the rules of the park and benefit from its ongoing research and education programs. Weekly slide shows entertain and inform divers of Saba’s special marine life. 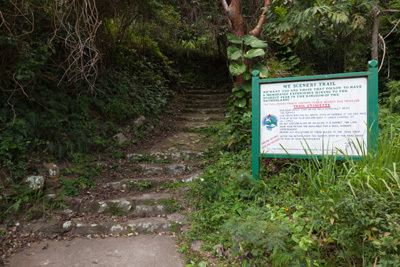 The Saba Marine Park has received several honors and remains the only park of its kind in the world to be completely self sufficient in its operation. Sea Saba Dive Center is a PADI 5-Star dive operation, as well as a PADI National Geographic Dive Center. Professionalism, adherence to the highest standards in the industry, safety, and an attentive & enthusiastic dive team are what you’ll experience when diving with this high quality operation. The dive shop is located right in the heart of Windwardside. Two well-equipped 40′ dive boats offer you the utmost in safety, comfort & convenience. Both the M/V Giant Stride and the M/V Sea Dragon feature ample seating, plenty of sun or shade, wind protection, hanging facilities, gear storage, fresh water shower, drinking water & lemonade, cold storage for lunches, camera bins, oxygen & first aid equipment, ship-to-shore communications & VHF radio. 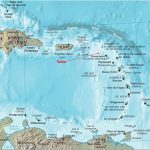 Although both boats are U.S. Coast Guard certified for 20 divers, Sea Saba maxes them out at 10 divers with 2 dive instructors except when specifically requested to do otherwise by pre-booked groups requesting to dive as a group. 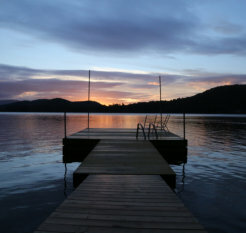 A typical dive day is as follows: You’ll be picked up from your hotel shortly before 9am and driven down to the harbor. Boats depart the harbor at 9:30am. After your first dive, the boat will moor at a beautiful, calm area where you can gaze at seabirds in the cliffs, snorkel, or simply take a nap. After a 60-90 min surface interval, you’ll enjoy a second dive, returning to the harbor at about 1:30pm. Afternoon dives are available upon request. Night dives are planned for every Tues, Thurs & Sun or upon request. Nitrox and a full range of dive courses & certifications are readily available. Come to Saba and “Dive the Sea Saba Difference”. Sport Diver magazine voted this dive site “One of the Best 10 Dive Sites” in July 2008. The dive can be conducted completely on top of a seamount plateau or with a short trip out to the tip of the “Eye of the Needle” (right), a pinnacle that rises majestically up from the deep. Common sightings included Blacktip Sharks, Yellowtail Snapper, Nassau Grouper, Yellowfin Grouper, Nurse Sharks and schools of reef fish. 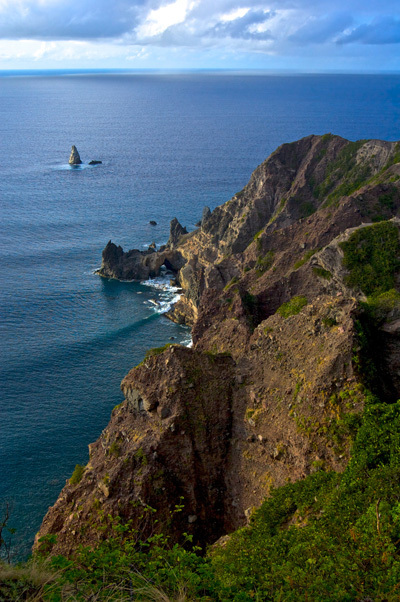 Diamond Rock sits on a flat, sandy bottom at 80 feet and rises up and out of the water to become one of Saba’s most famous landmarks. 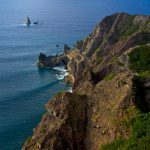 Circumnavigate the rock near the bottom while looking for Southern Stingrays & Flying Gurnards in the sand or explore the canyon on the northeast side while watching for sharks and schools of Horse Eye Jacks. This steep rock structure is located just east of Diamond Rock. It sits at 70 feet with twin peaks rising to 15 and 20 feet. Circumnavigating the base and slowly spiraling upward between the two peaks in figure eight fashion is the best approach here. 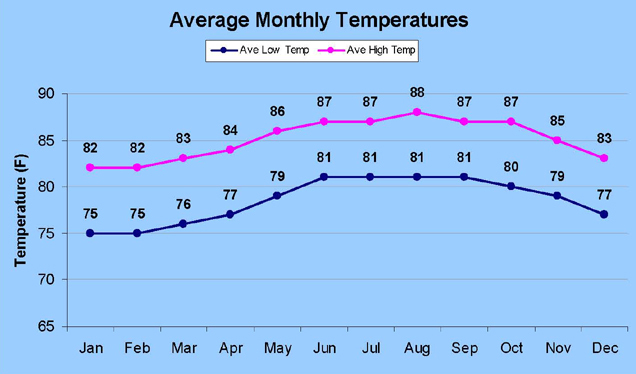 Look for Black Coral, Sergeant Majors, Sand Tile Fish, Atlantic Spadefish and African Pompano. This dramatic wall dive features rich color and looming overhangs. You’ll see a myriad of colorful sponge species while you search for Frogfish, Scorpionfish, White Nose Pipefish, Queen Angelfish and Barracuda. This site features huge boulders and a dramatic swim thru. 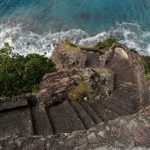 First, explore the sandy slope for Garden Eels and Southern Stingrays, then swim on through the boulders and archway toward the base of the mini-wall, all the while keeping a look out for Saba’s 2 inch Cherubfish, Hawksbill Turtles, Scorpionfish, Frogfish and Longsnout Seahorses. This site is characterized by low reef formations with deep overhangs. Check the sand patches for sleeping Nurse Sharks and Green Moray Eels. 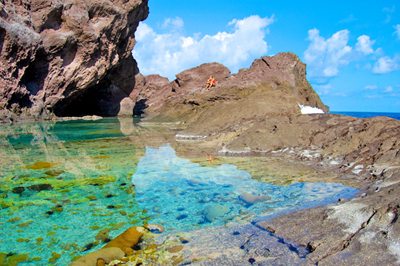 This calm and protected dive site, known as Saba’s nursury, also offers fabulous snorkeling. The entire dive can be done in less than 25 feet of water. Explore small caves while keeping an eye out for juvenile Spotted Drums, Spotted Snake Eels, Octopuses, Green Turtles, Hawksbill Turtles and more! 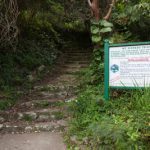 Nestled within a lush hillside in the village of Windwardside, Juliana’s Hotel is a short walk from Saba’s finest restaurants, gift shops, grocery stores, the museum, the start of the Mt. 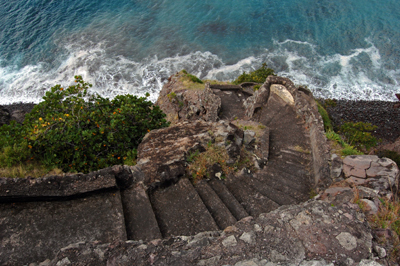 Scenery stairs and Sea Saba’s dive shop. This relaxing, laid-back and charming hotel offers a variety of accommodation categories to suit individual preferences. 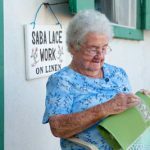 Choose from a Gardenview Room, an Oceanview Room, a fully equipped apartment, or one of three private Saban cottages (view from Orchid Cottage right). 3 air-conditioned Gardenview Rooms feature a queen bed, kitchenette (in 2 of the 3 rooms), coffee maker with coffee, tea, sugar & milk, semi private balcony, private bathroom w/shower, free wifi in room, flat-screen TV with satellite access, nightstand w/lamp, iPod dock, spacious closet, dresser, pool/dive towels, shampoo & soap. Hairdryers available upon request. 6 Oceanview Rooms are decorated with tropical fabrics, plantation furniture and tile flooring. One of the rooms has a king-size bed. The other 5 have two full-size beds. All rooms feature in-room refrigerator, coffee maker with coffee, tea, sugar & milk, private balcony with hammock, private bathroom with shower, table & chairs, free wifi in room, ceiling fan, flat-screen TV with satellite access, nightstand with lamp, iPod dock, spacious closet, dresser, pool/dive towels, shampoo & soap. Hairdryers are available upon request. 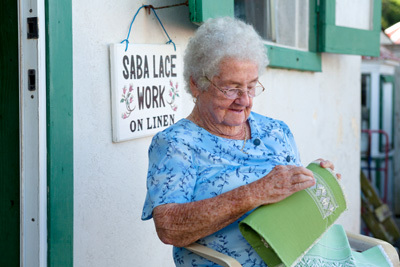 Flossie’s Cottage, a traditional Saban cottage, is approximately 100 years old and in excellent condition. Built on a stone foundation with gorgeous hardwood floors, it has an old stone and brick hearth which is now used as a mantle in one of its two bedrooms. The cottage features a fully equipped kitchen & dining room, a master bedroom with queen size bed, a 2nd bedroom with two single beds that may be joined together to form a king, private deck with six person Jacuzzi & BBQ grill, private bathroom w/shower, flat-screen TV with satellite access, free wifi in rooms, DVD player, ceiling fans throughout, nightstands w/lamps, iPod dock, spacious closet w/ironing facilities, dresser, pool/dive towels, hair dryer, shampoo & soap. The living room doors open to a side porch with a spectacular view of the mountain. Lily Pond Cottage is a traditional Saban Cottage set within tropical gardens complete with lily ponds, waterfall, private gazebo & hammock. The cottage also features a covered side porch with dining area, a fully equipped kitchen with original hearth and modern facilities, great room with sitting area and four-poster, queen-size bed, private & unique bathroom w/shower crafted from local stones, flat-screen TV with satellite access, free wifi, DVD player, ceiling fans throughout, iPod dock, closet with ironing facilities, dresser, pool/dive towels, hair dryer, shampoo & soap. The Mango Apartment is located on the second floor above the Gardenview Rooms. The apartment features a spacious covered porch with hammock & dining area, comfortable living room with with hand-woven couch & chairs, fully-equipped kitchen, air-conditioned bedroom w/four-poster, queen-size bed, rattan dresser drawers & nightstands, private bathroom with shower, free wifi in rooms, flat-screen TV with satellite access, ceiling fans, iPod dock, spacious closet, pool/dive towels, ironing board, hair dryer, shampoo & soap. During mango season, you can pick mangos right off the porch from the mango tree that shades the apartment. 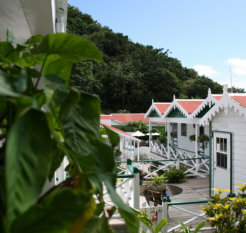 The Orchid Cottage is surrounded by a lush garden of tropical plants and exotic orchids. The Cottage features a covered veranda with teak lounger, dining table & chairs, well-appointed living/dining room w/CD stereo, DVD player & flat-screen TV with satellite access, fully-equipped kitchen, gas BBQ grill, unique outdoor bathroom enclosed by a rock formation, master bedroom w/air-conditioning & queen-size bed, 2nd bedroom w/two single beds that may be joined to form a king, free wifi in rooms, ceiling fans throughout, nightstands with lamps, iPod dock, spacious closets with ironing facilities, dresser, pool/dive towels, hair dryer, shampoo & soap. The on-site restaurant, Tropics Cafe, features a charming terrace dining room overlooking the pool with a panoramic view of the mountainside & the sparkling blue Caribbean Sea. Breakfast is included in your room rate and is served everyday off the menu from 7am-10am. Lunch and Happy Hour are enjoyed Tuesday-Sunday. TGIF is celebrated every Friday from 5pm-close. A tapas menu is offered every Sunday during happy hour. 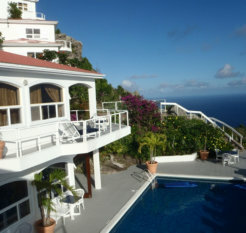 Shearwater Resort is a boutique luxury resort perched cliffside, 2,000 ft above the Caribbean Sea. Stunning panoramic views of crystal blue waters, the island of Saba and her neighboring islands greet you at every turn. The resort offers spacious guest rooms and baths with tropically chic décor and ultra-modern comfort. Choose from one of 4 Oceanview Rooms, the Gardenview Suite or the Oceanview Suite (balcony right). All rooms feature private balconies with panoramic Caribbean views. Also available are 2 Efficiency Apartments, each with a queen size bed and kitchenette. 4 Oceanview Rooms feature either a king or queen bed, superior linens, sitting area, desk, luxury bath with oversized shower, thick terry towels & robe, eco friendly spa bath amenities, HD TV with premium cable/satellite, DVD/CD/IPod surround sound, Wi-Fi, refrigerator, safe, coffee/tea service and hair dryer. The Gardenview Suite is over 1000 sq ft and features 2 king beds with superior quality linens, living area, luxury bath with oversized shower, lighted make up mirror, thick terry towels & robe, eco friendly spa bath amenities, refrigerator, 42” plasma HD TV with premium cable/satellite, DVD/CD/IPod surround sound, safe, Wi-Fi, coffee/tea service, hair dryer and a private oceanview balcony. The Oceanview Suite is over 1000 sq ft and features a king size bed with superior quality linens, living area, dining area, luxury bath with tub and shower, double vanities, lighted make up mirror, thick terry towels and robe, eco friendly spa bath amenities, personal refrigerator, 42” plasma HD TV with premium cable/satellite, DVD/CD/IPod surround sound, safe, Wi-Fi, coffee/tea service, hair dryer and an oversized private balcony with dining area, chaise lounge and an unobstructed view of the pool, Saba, her surrounding islands and the Caribbean Sea (photo above). Shearwater’s restaurant, Bistro del Mare, features creative Northern Italian cuisine with a menu that evolves constantly to showcase only the finest and freshest ingredients available, including locally grown produce and a wide variety of fresh fish and seafood. Choose from a wide selection of wines from around the world or let your server guide you through a food and wine pairing. Climb the 1,064 steps to the top of Mount Scenery (2,877 feet), not only the highest mountain on the island but the highest point in the Kingdom of the Netherlands. 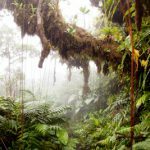 On your climb you’ll see palm trees, ferns, orchids, banana plants, mahogany trees, oleander, hibiscus, Saba’s national flower the ‘Black-eyed Susan’, colorful birds, bashful tree frogs & innocent snakes. The earlier in the day you start, the better chance you have of a clear view from the summit. 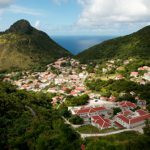 Explore the unique and uniform architecture of Saba…white wooden facades, green shutters, bright red sloped roofs and gingerbread woodcutting details. 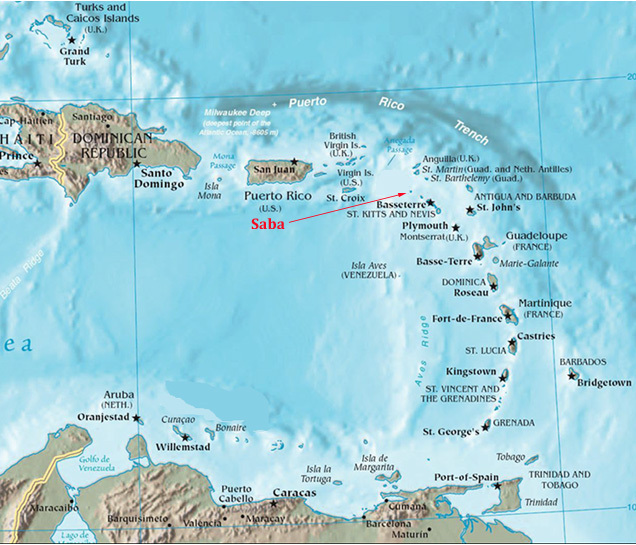 Saba is a small island located between St. Maarten & St. Kitts in the Northeastern Caribbean. 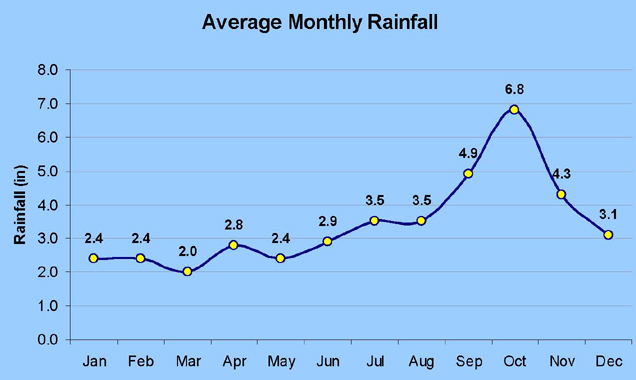 How long are the flights to Saba? 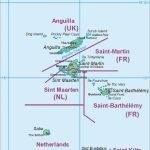 Saba is a short 15 minute flight from St. Maarten. 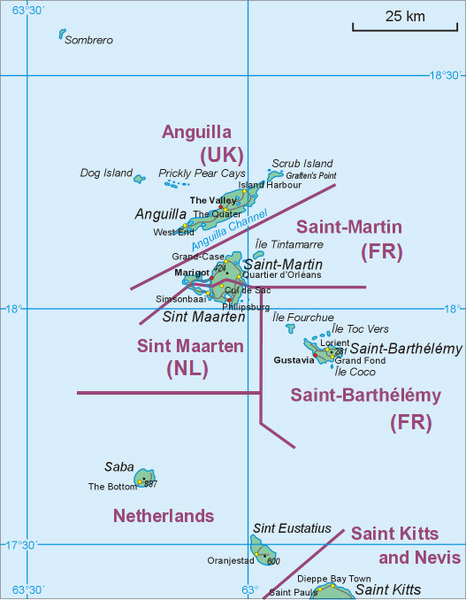 St. Maarten is approximately a 4 hour flight from Newark and a 3 hour flight from Miami. Since January 1, 2011, the U.S. dollar has been the official currency. 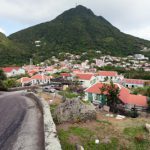 Yes, you will need a valid passport to enter Saba, as well as to re-enter the U.S. You are required to have an onward/return ticket, proof of sufficient funds and proof of lodging accommodations for your stay. The typical length of stay granted by immigration to U.S. citizens is thirty days, and may be extended to 180 days by the office of immigration. Always check www.travel.state.gov before traveling for the most current information. 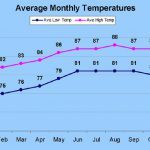 What's the average water temperature? 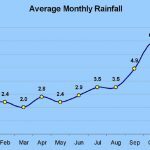 What's the average water visibility? Most dive sites are within a 15 minute boat ride of the harbor, allowing your dive day to start a little later than in other destinations. You’ll be picked up from your hotel shortly before 9am and driven down to the harbor. Boats depart the harbor at 9:30am. After your first dive, the boat will moor at a beautiful, calm area where you can gaze at seabirds in the cliffs, snorkel, or simply take a nap. After a 60-90 min surface interval, you’ll enjoy a second dive, returning to the harbor at about 1:30pm. Afternoon dives are available upon request. Night dives are planned for every Tues, Thurs & Sun or upon request.